As the spotlight moves away from the Fort Hood massacre, one of America's most openly radical Islamist organizations has taken to the murderer's defense. As-Sabiqun, a Washington D.C.-based organization with branches in four other major American cities, released a flyer labeling shooter Nidal Malik Hasan as "victimized" and the "target of psychological warfare." The handout also defended convicted terrorists and suspects. As-Sabiqun has repeatedly predicted the demise of the United States and dreams of "the Islamic State of North America no later than 2050." It has openly declared support for terrorist organizations like Hamas and Hizbullah, and even claimed it funded anti-American militants. With concerns growing over radical Islamist propaganda in the United States, As-Sabiqun is one of the leading organizations building a bridge between international Islamism and its developing American counterpart. "Well I'm telling you, it's very simple. I think you got the message now. We're in a big war brothers and sisters. This is as big as it gets for the United States. We are just like it is during the 60s and 70s. So if you're gonna be Muslim, buckle down and be a tough one because in the final analysis the U.S. is finished." "Your survival has made you stronger and better and better in management and organization than anybody else, just by your survival. Remember, a revolutionary do [sic] not have to win any war. They only have to survive, even if you lose 90 percent of your people. 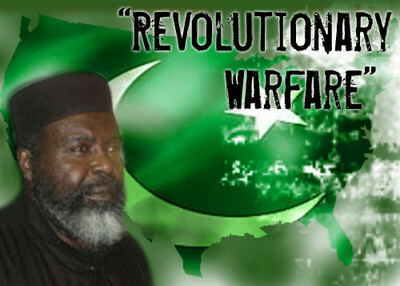 You have to understand revolutionary warfare. If you lose 90 percent of your wealth and people and you still moving around and mobile, you can come back. That's the rules of revolutionary warfare – to survive. I'm trying to tell you – the war is already won. [Musa laughs.] They just have to fall over." "So we have seen movements, because although we was in (UI word) in the first stage, and the next stage we were using criminal wealth to help our brothers, you know our brothers in Algeria and in Africa, they had fought the United States government, they was in exile. They knew about a revolution, but they didn't know nothing about money. Well, since I was a criminal, I knew all about making money. So all the criminal money that I made I would take it to the brothers and say – OK, you guys, buy me some weapons, you'll go back, we'll take over the United States. That was the dream that we had. You got to dream big. Ain't no sense in dreaming small, right? Live your dreams." "And this religion Islam will dominate all other religions whether the Americans, whether the British, whether the French, whether the Russians, whether the Japanese, whether all of them get together in one solid group to fight Islam. It don't make no difference. In the final analysis, Allah (swt) said that his religion—Islam—will rise to the forefront, will be elevated to the role of leadership in this world, whether they all like it or not." That same year, Musa called for an Islamic state in London during a conference there that featured a wide assortment of radicals, including representatives of FIS [Islamic Salvation Front], Hizbullah and Hamas. "When they go out and strike at the heart of Zionism. They are not suicide bombers they are heroes they are she-roes, isn't that right? That's a part of our deen, that's a part of our religion, let's not become weak boned and apologetic..."
"Islamophobia to us right now, coming out of 9-1-1 (9/11), is something that the [American] government and the Israelis did in the U.S. to justify a global attack on Islam … the perception management now by the media, gives the media and gives the military justification to invade our countries, to stop us in airports, to exclude us from society." The extremism expressed by As-Sabiqun and Musa might easily be passed off as the bizarre ranting of a radical cleric and his hateful organization. However, as the Fort Hood massacre, the FBI shooting of Luqman Abdullah and other recent investigations show, fiery rhetoric can lead to violent plotting. The lesson of Fort Hood is not to ignore open self-radicalization, but to heed those who openly preach our destruction from within. Please read the Constitution about treason. Treason committed destines one for prison. That's where Musa should be, prison for a long time! (1) As the spotlight moves away from the Fort Hood massacre, one of America's most openly radical Islamist organizations has taken to the murderer's defense. 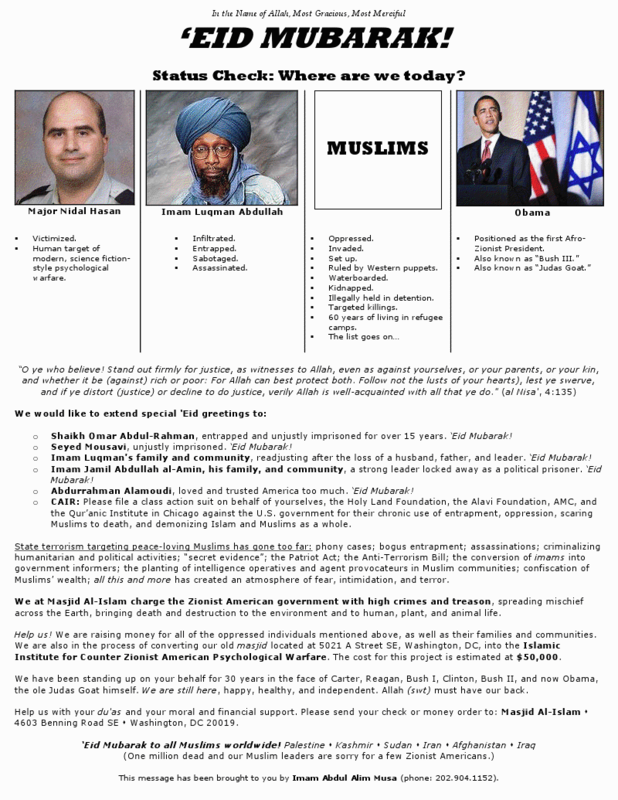 (2) As-Sabiqun, a Washington D.C.-based organization with branches in four other major American cities, released a flyer labeling shooter Nidal Malik Hasan as "victimized" and the "target of psychological warfare." (3)The handout also defended convicted terrorists and suspects. (5) This is not the first time this year that Musa has preached hate and militancy to an American Muslim student organization. (6) you know our brothers in Algeria and in Africa, they had fought the United States government, ... They knew about a revolution, but they didn't know nothing about money. (7)Well, since I was a criminal, I knew all about making money. So all the criminl money that I made I would take it to the brothers and say – OK, you guys, buy me some weapons, you'll go back, we'll take over the United States. That was the dream that we had. You got to dream big. Ain't no sense in dreaming small, right? Live your dreams." All these few excerpts speak volumes to any body who is sensitive and concerned for the human welfare and the values so dear to the concept of "Free World" we preach and live in. A stitch in time saves nine. I assert, the very foundations of 'Islam' need to be revamped and revised to make it compatible to the multicultural, multiethnic Modern Societies and World. I don't believe, the world is prepared to be subjugated by such open diehard criminals, who are spewing venom and are preparing to shook the the peace loving civilised World, in the name of religious barbarism. Then some others rise up to argue on their behalf, "Islam is a peace loving religion". But they do not go to stop them. In fact these guys are apparently funded by the Oil revenue, some suspect. I feel waste of time to further elaborate on this topic. I rather reitterate my final judgement that the world is at the brink of WWIII. I only pray to keep your tempo up. Please don't slow it down, I am sure, they will not disappoint me, seeing their bubbling flow of adrenaline. Keep it up and the Almighty may bless you all. I remember this kind of hate talk in the name of religion before and it did not overcome America. Smart people understood right from wrong and didn't participate in the trash. Some of those who used the hate talk back in the 40's, 50's, 60's and 70's are still around today they just don't wear their white sheets in the open anymore since the majority of America denounced their racist talk as blind hate. We didn't condem a whole group of people back then because of a few with hate in their heart (in the name of their god) and I don't feel we should do it now. I am muslim from pakistan and happened to interact with american people . I have found american people as honest , hardworking and candid in their approach. i liked them a lot and i look upon them. but i am truly surprized by US rulers,and US multinational companies . They are ruthless to muslims in many countries and not good for american people. they do not represent american culture and values . I donot understand who these people are and how they are elected ?. They are no different to ruling elite of any third world country, they lack vision ,are self centered and egoist . they are illtreating people across globe particularly muslims. they are endagering their own people , coming generations. spending billion of dollars on weapons to loot other nations. they are bringing misery to other natios as well as own. i request them (US Rulers ) to live up to american values, lead the world , today you are the leaders , hard work of american people has made it possible.